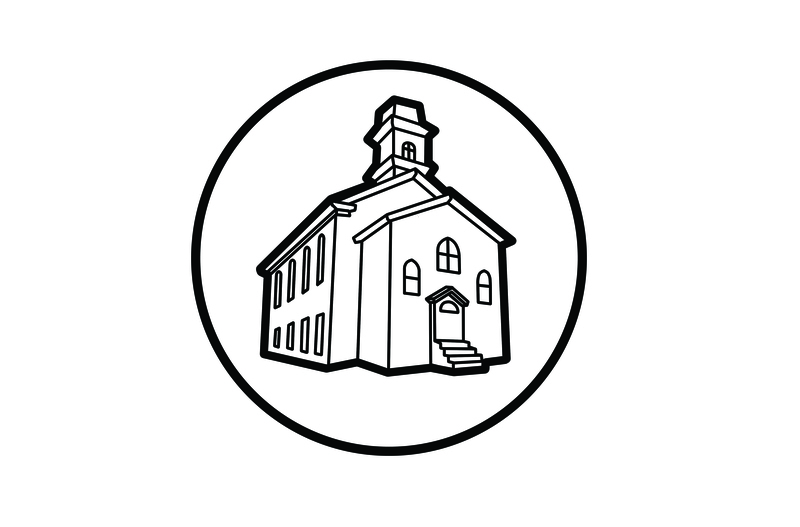 The Computer Church: The Micro-Altair from Polymorphic Systems. 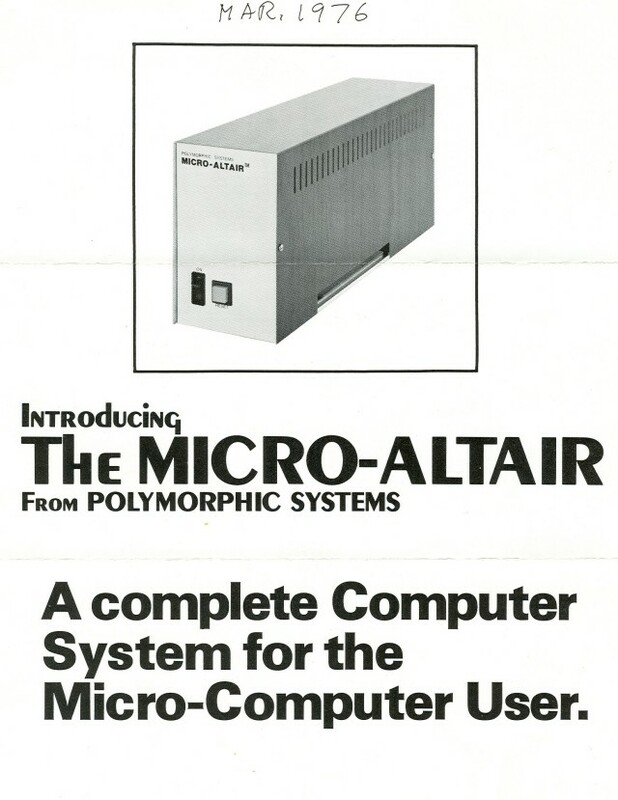 This is a very rare brochure that introduced Polymorphic Systems's first personal computer which was named the MICRO-ALTAIR. The brochure consists of a two page foldout and a green single-page insert "Order Form". The brochure dates from very early in 1976. The cover has a handwritten date of March 1976 which is supported by the Order Form. 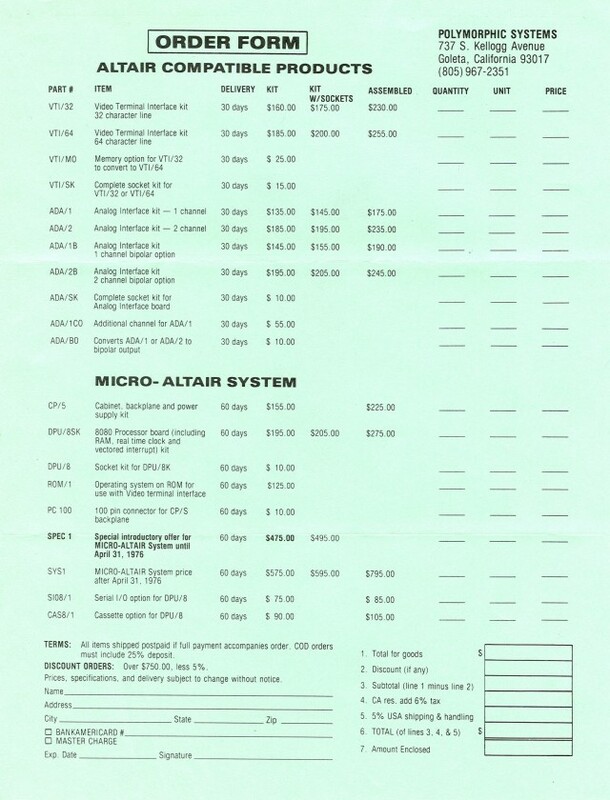 The inserted Order Form states that the computer could be bought for a "Special introductory offer for MICRO-ALTAIR System until April 31, 1976" so the brochure must pre-date that offer (the back cover of the brochure mentions the same offer). If you ordered the computer before April 31, 1976 the computer would cost $475 (in the kit form...an assembled form was not offered). After April 31st the price jumped to $575 for the kit or $795 assembled. Delivery for either the kit of the assembled computer was 60 days! 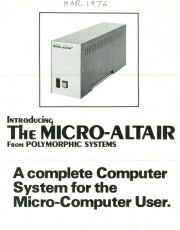 It's unclear why the people at Polymorphic thought that MITS (who made the Altair computer) would stand for a competitor offering a computer with such a similar name. It was still being called the MICRO-ALTAIR in an ad in the May 1976 issue of Popular Electronics. We have also found a reference to an ad in the May 1976 issue of Byte magazine on page 35. But by that winter, Polymorphic had given the computer a new name, the "Poly-88". In his book, A History of the Personal Computer, Ray Allen claims that Polymorphic was establish in 1975 and that "The company announced their first computer in October 1976. 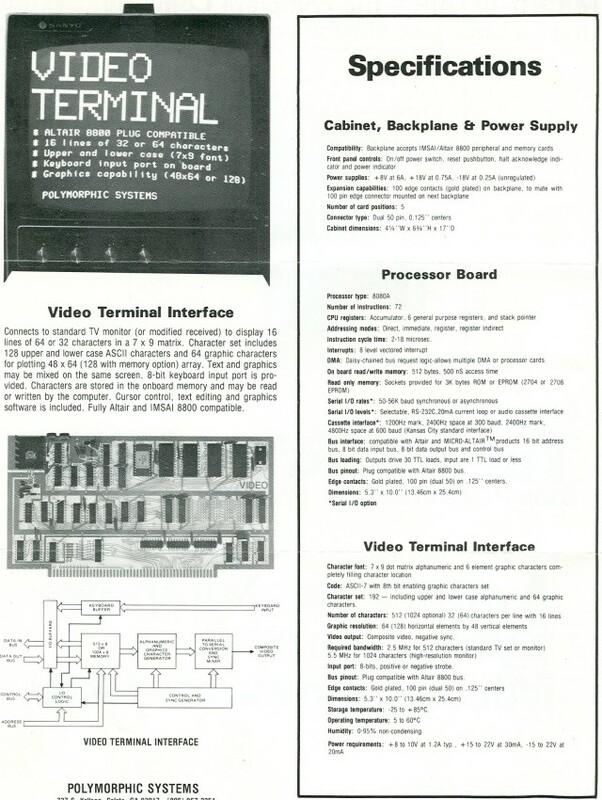 "(Allen, p. 27) This brochure proves that the company had announced their first computer by at least March 1976.